The latest version of Collier Research Corporation’s HyperSizer composite structural analysis and optimisation software runs much faster and enables the skilled non-expert user to get more accurate answers from less input. Version 6.4.5 of HyperSizer is said to be based on a reconfigured core technology with built-in ‘intelligence’ that produces more accurate answers with less user input. “We’ve developed a completely different approach that will make the general engineer’s job easier while providing reliable results much faster than before,” claims Collier Research president and founder Craig Collier. The analysis engine of HyperSizer v6.4.5 also takes advantage of today’s high-performance computing technology to speed up runs by 200-400%. Optional quick sizing and variable tuning capabilities are as much as 1000 times faster. For the wind energy industry, weight/cost optimisation has also been added to enable engineers to include the effects of material choices on tools, labour, facilities, etc., when studying tradeoffs between carbon fibre and glass fibre. The first software commercialised out of NASA, HyperSizer is the flagship product of Collier Research Corporation. 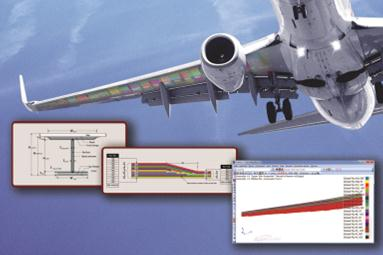 It provides stress analysis and sizing optimisation, reducing the weight of aircraft, space vehicles, wind turbine blades and other structures, whether designed with composite or metallic materials.